Lombardi’s on the Sound at the Port Jefferson Country Club at Harbor Hills is located in the exclusive Belle Terre Village section of Pt Jeff, Long Island, NY. Overlooking the LI Sound, Lombardi’s offers it’s clients breathtaking views of the water. This picture was taken from the overhead deck where your cocktail hour takes place. 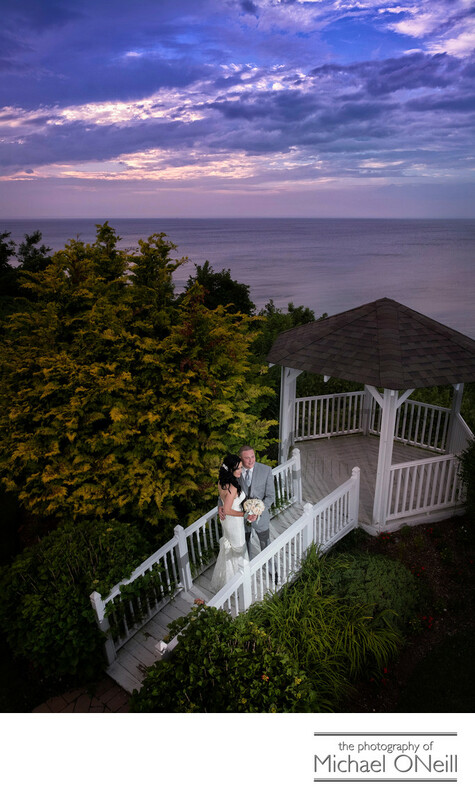 The sunsets at this venue are awesome and your professional wedding photographer will know the perfect time to capture the beauty of the setting sun on your big day. Having been affiliated with the Lombardi family for more than 2o years I have had more opportunities to photograph weddings at their venues than I could ever remember. In addition to this location the Lombardi family maintains catering venues in Holbrook, NY (Villa Lombardi’s) and on the Great South Bay in Patchogue, Long Island (Lombardi’s on the Bay). A picture like this, which will give you years of fond memories, takes only a minute to execute by a knowledgable professional wedding photographer. My experience, not only as a Long Island wedding photographer, but also as a regular visitor to Lombardi’s on the Sound; enables me to capture dramatic images such as this one in two minutes or less. There is no reason to miss your party in order to get awesome wedding photos. If you want an amazing sunset picture on your LI waterfront wedding give me a call. I’d love to give it to you.